We love savouring the moments when we are exploring new places. But when we get home, where do we put the photos, tickets and collection pieces? 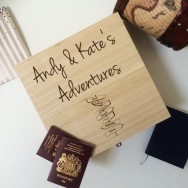 Our perfectly personalised adventure keepsake box is the perfect place. Whether it's for someone special who's just been travelling or for yourself.